When the Review Crew was offered the opportunity to review several different DVD titles from FishFlix.com, choosing which DVD I preferred to review was the hardest part. I settled on asking for Privileged Species: How the Cosmos Is Designed for Human Life, a 33 minute documentary that discusses the evidence of Intelligent Design. I watched this DVD alone. I had planned to watch it with the kids, but had the chance to watch it alone while the kids were busy, so I opted for a better listening environment. Now that I have watched it, I’m not certain that they would understand very much of it, but I still plan to put it on for at least the older ones. As all elementary ages, my children will walk away with varying degrees of understanding, but the pictures alone will keep them entertained. 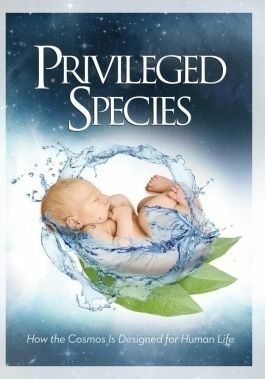 Privileged Species was a well done full color documentary interviewing many experts in the scientific field regarding the earth, space, carbon, oxygen, water, and how all of creation points toward an intelligent creator and not a mere accident. With terms like viscosity, carbon, thermal properties, water, tectonic cycles, hydrolytic/water cycles, oxygen, earth’s size, photosynthesis, radiant energy, diatomic molecules/oxygen discussed, my head was rather spinning with information foreign to my rather pathetic scientific knowledge. Despite not understanding some of it, I walked away with a reconfirmed absolute confidence in a created world… created by my God. I was surprised that they never named the creator as God but merely presented their case that we have a creator, but, well, I can take it from there I suppose. “It’s as if from the very moment of creation the biochemistry of life was already preordained in the atom building process, as if nature were bias to this end from the beginning. The movie pictures themselves are a lot of still photos or limited movement videos. Other than the interviews, much of the video is merely colorful and relevant pictures and the speaker is by far the star of the show. It does require pretty close attention – the information will lose you in a heartbeat if you aren’t paying full attention. I had to back it up multiple times when the kids interrupted, but the information will cause you to step back and marvel at the world God created and His knowledge of all we would need before the beginning of time. He created a world for us that sustains us in ways we never even consider, and it was so good to be reminded of God’s love and mercies and provision for us. I highly recommend this film and can only imagine the others offered by FishFlix.com are also very good. This DVD is currently listed for $9.99. FishFlix.com offers many other Christian DVDs for your family to enjoy. They offer free shipping on orders of $35 or more. To read the rest of the Crew’s thoughts on this and several other DVD selections, visit the Review Crew Blog.